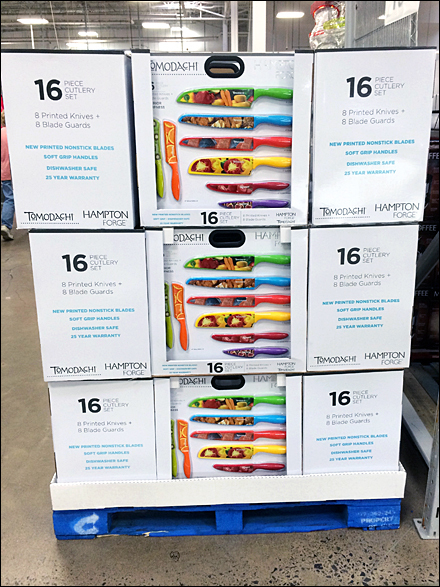 The point-of-purchase copy touted numerous benefits, and downplayed the one most visually interesting and moderne in approach … the color coding to prevent cross contamination of tastes during food prep. 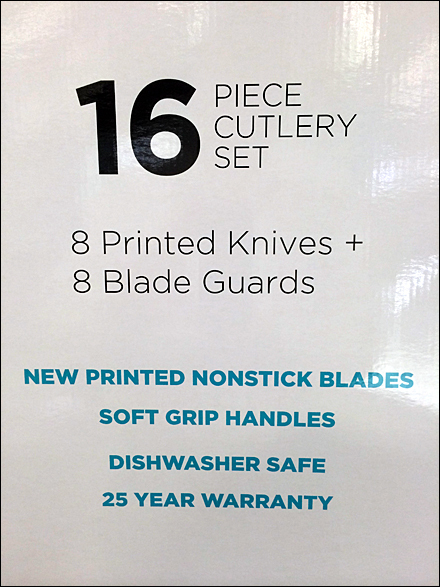 In true advertising style the slightly more spurious benefit of “16 Pieces … 8 Knives, 8 Blade Guards” was hawked as the focus. As an adman myself I would have had to promote the same “benefit” … but as consumer you might not consider 8 Blade Guards true additional pieces in a knife-set purchase. Tricky folk these ad copy writers. Sold by the Pallet, there were high hopes for the success of this Warehouse Club offering. CLICK through the gallery for a closer look, and the thumbnail for copywriter benefits.